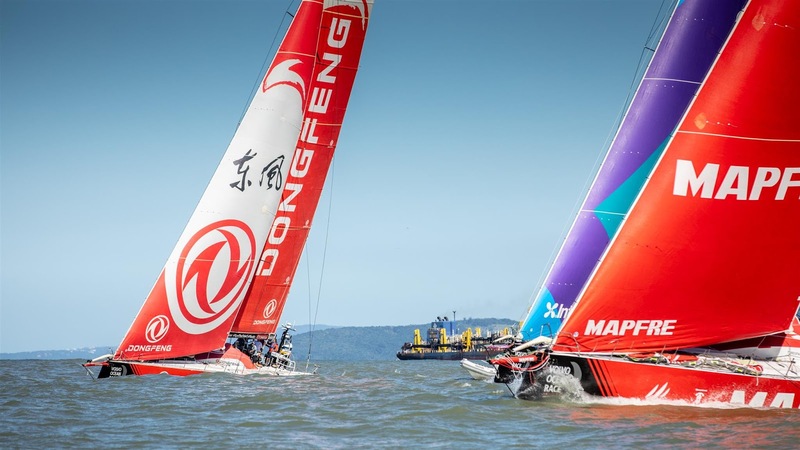 After seven tough legs of the 2017-18 Volvo Ocean Race, the Chinese sponsored Dongfeng Race Team is leading in the overall rankings, having converted a five-point deficit on rivals MAPFRE to a one-point advantage. But this race is far from over with four more legs still to come, starting on Sunday with another marathon voyage on Leg 8 which takes the fleet from Itajai in Brazil, across the Equator and through the Doldrums north to Newport, Rhode Island. Pascal Bidégorry, the navigator on Dongfeng and right-hand man of skipper Charles Caudrelier, is pleased with the state of affairs for his team but, like Caudrelier, he knows that this race has a habit of catching the unwary out. It won’t be until the finish line at The Hague at the end of June that the drama is finally over. “We will see what happens next – we have four legs to finish the race and we are in a position where we can win,” said Bidégorry at the Dongfeng team base at the race village in Itajai. “We are going to push until the end and that is very good – it is at this stage of the race that we hope all our hard work in training will start to pay off so that we can remain consistent until the end, but we know that MAPFRE and Team Brunel will be working hard as well. What has really struck Bidégorry is the mood in the Dongfeng camp. The team, sponsored by the Chinese car and truck manufacturer Dongfeng Motor Corporation, started the race in October as many people’s favourites, but it has struggled to overcome the challenge of Xabi Fernandez’s crew on MAPFRE. However, consistent sailing and scoring five podiums in six competitive legs has enabled Dongfeng Race Team to take the lea. Bidégorry praised the Dongfeng shore team who, he says, have got the red and white Volvo Ocean 65 in great shape for the remainder of the race. “They have worked so hard to give us back a boat we can push on the final few legs,” he said. Fellow French crew and bowman on board Dongfeng, Kevin Escoffier, says the team has its destiny in its own hands. “This is the first time that we are leading the race in front of MAPFRE,” he said. “We have everything we need to finish the race in good shape and put everything together so that we are in the same place as we are now at the finish in The Hague. “It’s important to stay focused until the end, especially close to the finish when the legs get shorter in Europe but with the same amount of points to take,” Escoffier added. “Plus, with the double-points transatlantic stage, there is a lot to lose. Setting sail on Dongfeng on Sunday will be the usual multi-national and mixed male and female crew led by Caudrelier. The seven-time Volvo Ocean Race veteran Stu Bannatyne is back on board. The Kiwi legend returns to the team as watch captain in place of the French Vendee Globe star Jérémie Beyou who is taking a well-earned rest. Bannatyne sailed the first four legs of the race but has been off the boat since the end of Leg 4 at Melbourne. “It’s great to be back on board with the team on Dongfeng,” said the straight-talking New Zealander, known to his teammates as “Magic Stu” because of his speed as a driver. “The team has certainly been through some challenging racing since I was last with them and I am looking forward to helping to build on what they have achieved in the next leg,” he said. This is Dongfeng Race Team’s second consecutive Volvo Ocean Race campaign, having finished third overall under Caudrelier in 2014-15. The team is committed to sailing to the best of its ability in this race but also to helping to build the sport of sailing in China.